Rhya was a wonderful foundation for our small breeding program, and is missed so very much. The house is far too quiet without her. Thanks to her breeder, Bonnie McMahon-Howen of Kasaan Kennels, for trusting me with this beautiful girl! Rhya was the product of a very special breeding- her sire, "Fly", came to this country from his native Australia in the fall of 2003. His pedigree carries many famous Mals from the past, back into the present- we are proud to have these bloodlines in our kennel! "Fly" finished his American Championship as the FIRST Australian-bred Mal to do so. Rhya's mother, "Ari", was a daughter of BISS Ch. 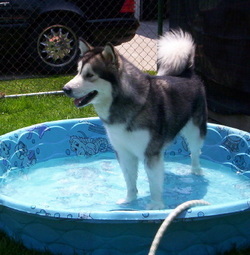 Kasaan's Fortune Player- "Gambler" was the Best of Breed winner at the Alaskan Malamute Club of America's National Specialty in 2000! In very limited showing, Rhya finished her American Championship (owner-handled to all her points!) in April 2009. She completed her Working Weight Pull Dog title and her Working Pack Dog title. 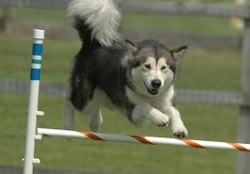 Competing in the agility ring was her favorite activity- she collected several titles in AKC and CPE agility. In 2015, Rhya was awarded the VAM (Versatile Alaskan Malamute) and SAM (Serviceable Alaskan Malamute) titles, which are part of the AMCA Versatility Program. Rhya's name was derived from "Rhyolite"- which is the volcanic equivalent of plutonic granite!